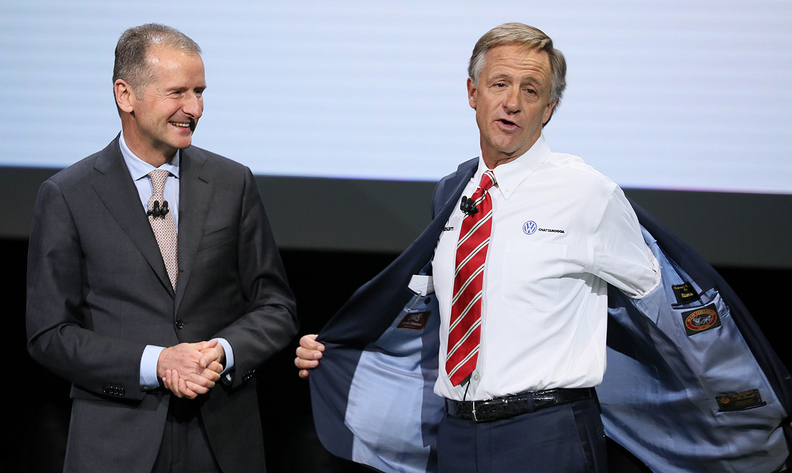 Volkswagen CEO Herbert Diess had some good news for Tennessee Gov. Bill Haslam at the Detroit auto show last month -- a new assembly plant and 1,000 jobs in Chattanooga. The two appeared on stage together to make the announcement. DETROIT -- Volkswagen Group is adding a second Chattanooga assembly plant in Tennessee to build electric vehicles for Volkswagen and potentially other brands, with an $800 million investment expected to create 1,000 jobs at the German automaker's only U.S. assembly operation. VW said Monday the new factory -- which will be built next to the existing plant producing internal combustion vehicles -- will begin producing EVs for North America in 2022. The EVs will be built on VW's modular electric toolkit chassis, known as MEB. "The U.S. is one of the most important locations for us and producing electric cars in Chattanooga is a key part of our growth strategy in North America," VW Group CEO Herbert Diess said in a statement. "The management team, led by Scott Keogh, is committed to continuing to increase our market share in the coming years. Together with our ongoing investments and this increase in local production, we are strengthening the foundation for sustainable growth of the Volkswagen brand in the U.S."
Diess and leaders of Volkswagen Group of America have laid out an aggressive battery-electric plan for North America, beginning with the I.D. Crozz crossover set to arrive in the United States in 2020, and including what the automaker calls a "multipurpose" electric vehicle based on the I.D. Buzz concept. The I.D. Buzz was a retro styled version of VW's former Microbus, and is expected to return to the U.S. in 2022. VW Group has committed almost $50 billion through 2023 to carry out the EV plans worldwide. Those plans include at least two other battery-electric models for U.S. consumers, part of the automaker's blueprint to produce and sell as many as 27 full-electric models globally by 2022. VW believes it can sell at least 150,000 EVs globally by 2020, and ramp that number up to 1 million worldwide by 2025. VW's Chattanooga assembly plant, which opened in 2011, builds the Atlas crossover and Passat sedan. A five-seat version of the Atlas, the Atlas Cross Sport, will go into production there this year. For now, the Chattanooga EV plant would build only Volkswagen-branded vehicles. But late last year, VW Group leaders disclosed plans to begin consolidating production to save money, instead of segregating it by brand as the group does now. That could mean the plant would produce MEB-based Audi EVs at some point as well, though no announcement has been made. Volkswagen Group of America CEO Scott Keogh -- who introduced the first Audi EV, the e-tron crossover, in September when he was President of Audi of America -- said VW brand's plans are about transforming EVs from a niche to a mass market. "We could not be prouder to build the future of mobility here in the U.S.," Keogh said in a statement. "We're known as 'the people's car' for a reason, and our EVs will build on that tradition." VW did not reveal where it will source battery packs for EVs produced at the new Chattanooga plant. But South Korean lithium ion battery producer SK Innovation Co. said last year it will begin construction soon on a $1.67 billion battery plant in Commerce, Ga., about an hour northeast of Atlanta and 150 miles southeast of Chattanooga. SK plans to employ 2,000 workers producing an annual volume of lithium ion batteries equal to 9.8 gigawatt-hours by 2022. Speaking to Automotive News on Oct. 31, Diess said VW had already "sourced the batteries for 15 million electric cars, so this is a huge momentum coming, and probably from a volume piece, I think we have the best setup strategy for the electric vehicles to come." Diess said battery-electric vehicles represented "a chance for Volkswagen. It suits the brand. It will be a very sophisticated product, a modern product, fully connected, and my feeling is, from the first meetings we had that we share that view." VW's global EV strategy -- developed during and in the wake of its $31 billion global diesel emissions crisis -- seeks to capitalize on the group's economies of scale. Its modular MEB platform can use different sized battery packs and give designers broad leeway to develop a wide range of "top hat" offerings to ride above the battery packs. So far, VW's first designs, such as the I.D. hatchback, feature much more interior space than a similar-sized internal combustion vehicle, as well as a range of 250 to 375 miles, fast acceleration and charging, at a price similar to that of a turbodiesel, Diess said. "Many -- not all -- would consider an electric car, because if you are still driving far distances, 20,000 or 30,000 miles, it's probably not the right car. But there are so many people who are driving longer distances only so often, and it makes a lot of sense, in Europe, in China, and in the United States, because the cars are really becoming good," Diess said. "It's not all over the world, because electric cars don't make sense all over the world. But in areas where we have affluent people, where renewable energy is available, electric cars make a lot of sense."